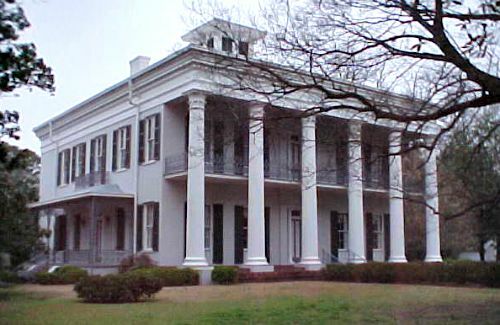 Sturdivant Hall is one of the finest examples of Greek revival architecture in the state of Alabama. Construction started in 1852 on the orders of Thomas Helm Lee for Colonel Edward T. Watts and took 4 years to complete, and it is also commonly known as the Watts Parkman Gillman home. The home was purchased from its first owner on the 12th February 1864 by a man named John McGee Parkman, which led in part to the home being known by its other name. Parkman made a few mistakes in his banking career and this led to him losing a lot of money out of the banks pocket, to the point where he was actually arrested and imprisoned, but with the help of some of his friends he was broke out of jail, though he died in the escape attempt. Today the house is open to the public for events such as wedding and corporate functions, it was also added to the National Register of Historic Places in 1973 due to its architectural significance. There aren't many mansions out there that are this old that aren't thought to be haunted, and this place is no exception. Since there weren't any major tragedies or hardships that took place here is a wonder why so many people think its as haunted as it is, and it has even been featured on a couple of TV shows and books on haunted places. Apart from some minor activity that you can find pretty much everywhere, such as orbs and noise phenomenon, there is only thought to be one ghost that resides here. The spirit that haunts the mansion is thought to be the ghost of John McGee Parkman, who tried to get back to the mansion after being bust out of jail, though he never made it and died from a gun shot wound he sustained in his attempt. Claims of his apparition roaming the hallways and grounds have been reported more than once, with some claims even telling of how he has been seen with his hand clamped firmly to his side where he was shot.